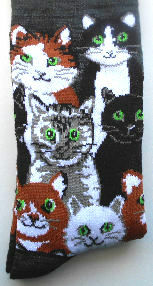 Here is a crew of smiling cats for your legs and feet. These dark grey/black crew socks are 75" rayon from bamboo, 23% polyester and 2% spandex. The bamboo rayon makes these socks very soft. The socks fit women's sock sizes 9 - 11.